CHED Scholarship Master's Thesis Grant Program 2018 - Application for CHED Scholarship Master's Thesis Grant Program for Fulltime/Regular Faculty is now available. 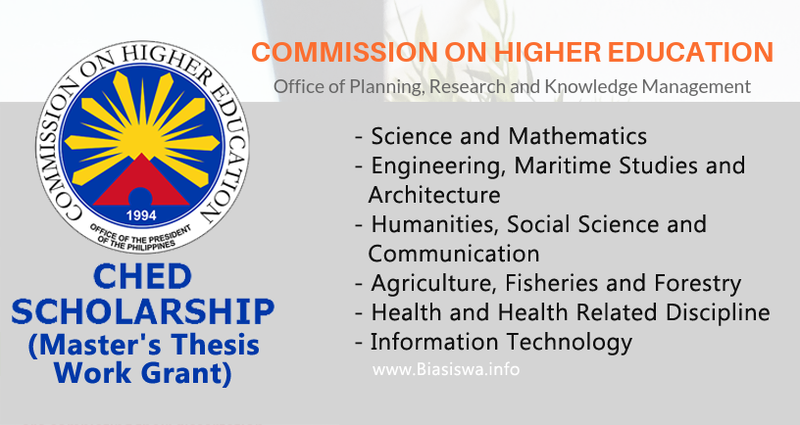 The CHED Thesis Grant Program is aimed at upgrading the research manpower capability of higher education institutions (HEIs) while supporting the conduct of research on identified priority areas. CHED provides financial assistance to fulltime/regular faculty members who are completing their Master's thesis work. Must have a general average of at least 1.75 or equivalent in the required courses leading to Master's degree applied for.